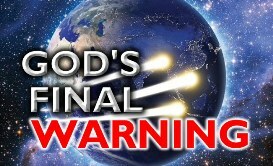 The three angels messages in Revelation 14, and the 'fourth' angel of Revelation 18 contains God's final warning and call of mercy to the world, before the return of Jesus Christ. These messages are of such great importance that they have just as much significance, if not more, as the message Noah gave to the world before the flood. So any true believer should be greatly stirred by this. Time is running out friends! What interests me, is that these messages contain very strong and dire warnings. Not just for unbelievers, but especially for those professing the Christian faith. And yet, these are messages of love, because God doesn't just show His love for us by saying 'nice' things. He also shows His love by warning us, and telling us of the consequences if we don't heed those warnings. But why is that 'interesting'? Because if you give these warning messages of Revelation to the professed Christian churches throughout the world today, the majority of them will tell you that you are not being 'loving' or 'brotherly' and will reject those messages. But what did the Lord say? "As many as I love, I rebuke and chasten" (Revelation 3:19). So let us heed the warnings! All three messages are linked together and cannot be separated as they give a combined warning to the world about who it is we should worship and obey. Please also see CHRIST AND HIS RIGHTEOUSNESS and THE ONE TRUE GOD IN THE 3 ANGELS MESSAGES in connection with this page. 'fear God' - What does it mean to 'fear God'? Does it mean to literally be 'scared' of God? Well, let's take a look at what the Bible says concerning the 'fear of God'. So living in the fear of God is to hate the things that God hates - SIN. Which means we are to turn away from all manner of sin and wickedness - And that includes watching sin on the tv or listening to sinful music! So if we are to 'hate sin', then what are we to do? Love righteousness! So to 'fear God' is really to love righteousness. And Jesus said in Matthew 5 that those who 'hunger and thirst after righteousness will be filled.' What will we be filled with? The very Spirit and life of Christ Himself. So this specific end time call for God's people to come out of Babylon, isn't a specific message for the Roman Catholic Church or any other false religion, because the call has always been for people to come out of false religion, and to turn to the one true God. No, this call is a specific call for God's very own people to come out of a 'body' that has BECOME fallen and has BECOME the habitation of every foul spirit. And what 'body' is that? The fallen Protestant churches, which have rejected truth and are uniting in this ecumenical movement with the 'mother whore', the Roman Catholic Church. What is the ROOT cause of the fall of the Protestant churches? Look at what Paul said in 1 Corinthians 3:4-7 ...'For while one saith, I am of Paul; and another, I am of Apollos; are ye not carnal?' This is exactly what the fallen churches have done. They have followed after MAN and the TRADITIONS of man, rather than following God and His truth alone! And many will be lost because of this. Christ must be our leader, not man. The churches have been progressively falling further into apostasy by "fornicating" with the world and allowing the heathen world to influence their "worship". Part of this apostasy is the teaching that we can be saved IN our sins, when the Bible clearly teaches that Jesus saves us FROM our sins. In other words, when we truly come to Christ Jesus and accept His righteousness for salvation, the evidence of our true faith is turning away from our sinful nature and keeping the commandments of God. And the third angel confirms that the true saints are those who are keeping God's commandments through Jesus Christ living IN them. Thus they are accounted 'righteous' before God in Jesus. This is the most solemn end time message, and we must make every effort to search and seek the truth on this matter. But we cannot look to man for understanding. We must look to God. Fall on your knees before God and pray that He will guide you to His truth and open your eyes on this matter. It is amazing that so many people have been deceived into thinking that the mark of the beast is simply some sort of microchip or ID card. This is more Hollywood fiction than Bible truth! Yes, technology will be used to help enforce the mark. But this issue is much, much deeper than just some material thing. The third angels' message above actually gives us the clue as to what the mark of the beast will be. First the angel describes what will happen to those who take the mark and end up "spiritually" worshipping the beast. Then he says something of great importance and truth. He says that the "saints", the ones who DON'T take the mark, are the ones "keeping the ten commandments of God and the faith OF Jesus".